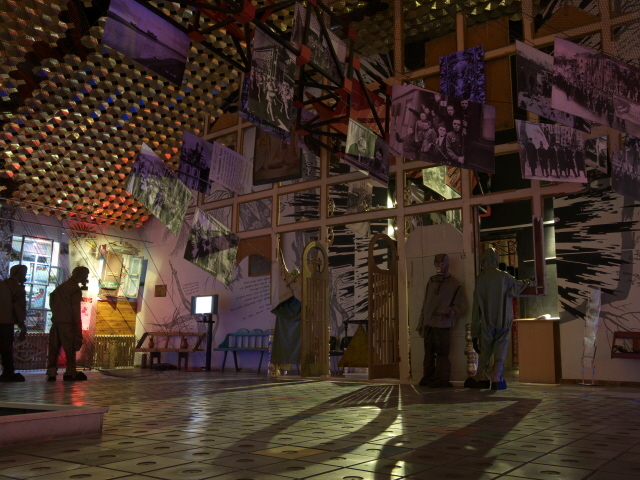 A museum in Kiev, Ukraine, that is, as the name suggests, about the Chernobyl disaster and its aftermath. It's impressive in its own way – and the next best thing to actually going on a Chernobyl tour. More background information: see under Chernobyl, Pripyat and especially under Chernobyl NPP. What there is to see: I returned to this museum in May 2015, and since my first visit to the museum in 2006 quite a bit has changed, mostly for the better. Most importantly, the museum now caters a lot better for foreign visitors than it did back then. They now have an English-language audio guide, so you can really study the museum to the max … and I saw quite a few foreigners doing just that. Personally I gave the audio guide a miss though, partly because I generally don't particularly like using them, and also because I had been before and am quite familiar with the story of Chernobyl anyway. So I can't comment on the quality of the audio guide. But it's good to see these are now provided. For first-time visitors these are probably a valuable asset. There's also a bit more English-language provision in the museum exhibition itself now. Most labels and texts are still in Ukrainian or Russian only, but a few now bear translations into English. Furthermore there are now a couple of interactive screens that offer an English-language choice. But before you even enter the museum you could have a look around the outside. In front of the building is an open-air display of several vintage Soviet-era vehicles, such as jeeps, a small fire brigade van and a large armoured vehicle, all of the type involved in the clear-up of Chernobyl. (I very much doubt these very same specimens were involved themselves, but their types … otherwise these vehicles would have come with radiation warning signs just like the ones in the vehicle display in Chernobyl town). 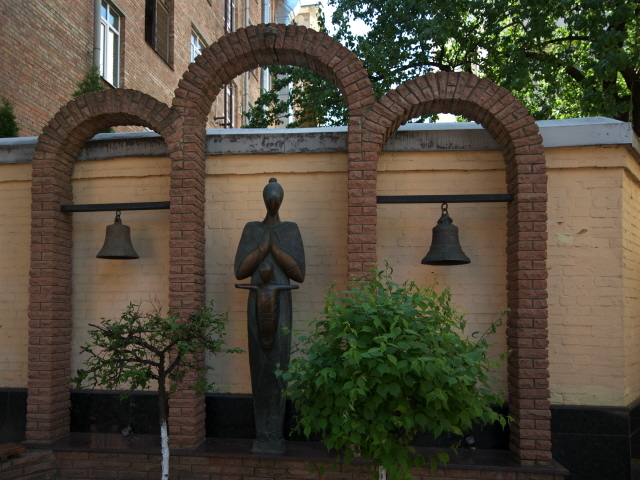 There is also a small memorial monument to the right of the museum entrance – of quite simple design: three brick arches, the outer ones with bells, the inner one with a somewhat abstract statue of a mother and child. The museum's main permanent exhibition is upstairs. As you ascend the stairs you walk under two rows of place names – each with the same name also on the back, but crossed out … like those signs you see by the roadside when you enter and leave a village or town. Part of the new Japanese extra exhibition interfered a bit with the effect of this when I was there in May 2015, with big paper fish kites distracting from the place names. But still, the intended symbolism is clear: these are all the disappeared places, the homes so many people lost due to the disaster. Once at the top of the stairs, a museum warden ushers you straight into the correct direction to the first exhibition room. Here you are greeted by a rather bizarre display of firemen and liquidators hanging diagonally from the ceiling and a fire hose stretching out across the length of the room under the ceiling. 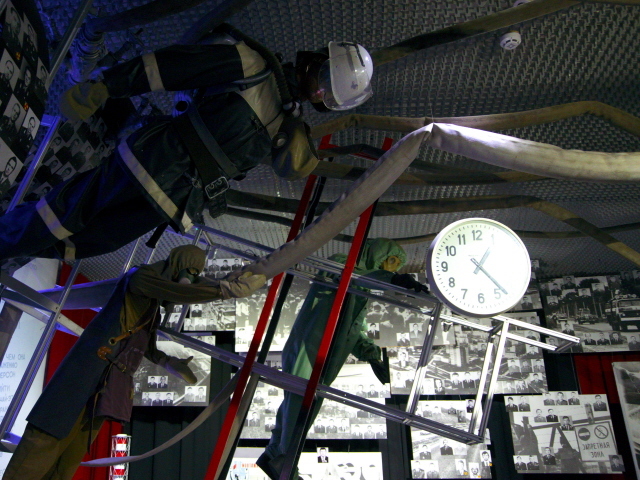 Next to the flying liquidator dummies is a scale model of Chernobyl NPP's reactor 4, and the museum warden rushes over to flick a switch on the side of the model. With this a few coloured lights are set in motion providing a (very) vague indication of the water and steam circulation systems within the reactor. If you don't already know how such nuclear power plants work, this model will hardly be of such significant educational value. But it's cool in any case because you get an impression of what it looked like inside the reactor hall before the explosion. The walls of this first exhibition rooms are covered with a mixture of photo-and-text displays and a few artefacts (e.g. various types of dosimeters). Thematically this is all about the disaster itself and, even more so, the clean-up operations. They also show video footage, such as that of liquidators being dropped by helicopter onto the roof where they frantically shovel up some of the highly radioactive debris … while wearing rather insufficient protective clothes. There are little portrait photos of men, many of which are marked by a little yellow radiation symbol. Why, should be obvious enough. At the far end of the first room is a special display that is only activated on guided tours. At first I walked past thinking little of it, just a picture of reactor 4, but then a guided tour arrived and the guide pressed some switch and the display came to life. The display changed from what the plant looked like just before the disaster, to a scene during the fateful night of the explosion and fire, and back to daylight on the morning after – with that huge gaping hole where the reactor roof had been – followed by a representation of the reactor with its original sarcophagus. Interestingly they made a few mistakes in the background: note the two cooling towers under construction in the back – in the last display both are suddenly of similar height (even though in reality only one was half finished and the second one remained a stump). Also count the number of chimney stacks on Blocks 1 & 2 (see photos below) and spot the continuity errors here ... Never mind, this just adds a quirky little bit of charm. Around the back en route to the next exhibition room things suddenly get a lot more colourful. Lavish LED lighting has arrived here, and there is also a projection onto the floor. These are new modern elements added since my first visit here. Hanging from the ceiling in the centre of this section is a double (coaxial) rotor of a Soviet helicopter that was typical of the Kamov design. But why it is here is not further explained (as far as I could make out). It appears to be just for atmospheric effect. Continuing into the next exhibition room, the subject matter moves on to medical after-effects as well as to the international reaction to the disaster. 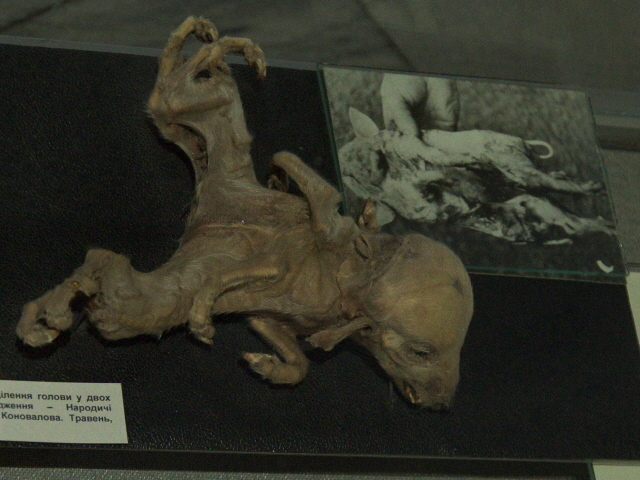 A particularly gruesome exhibit here is the deformed foetus of an animal (a pig perhaps?) in one of the glass display cabinets. On a lighter note, one section of the exhibition celebrates the aid sent by countries such as Germany, especially for the children of Chernobyl. 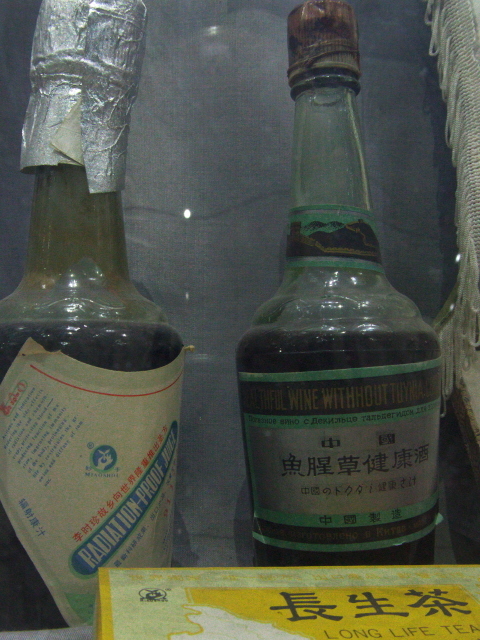 A particularly puzzling exhibit is part of a display of articles sent as aid from abroad: a bottle covered with lots of Japanese writing and the single English line "radiation-proof juice". But how on Earth do you make juice radiation-proof?!? Next to this is an additional about the atomic bombing of Hiroshima – presumably as a nod to a shared history as key moments in the nuclear age. After all, both names, Hiroshima and Chernobyl, stand so powerfully for the whole concept of nuclear catastrophe … even though the two historical events were of totally different natures (see also under Chernobyl NPP!). Yet another element that surely dramatizes the whole topic but is ultimately unrelated to Chernobyl is a screen showing well-known footage of nuclear testing at the Nevada Proving Grounds (cf. Atomic Testing Museum, Las Vegas). Finally you come to the largest of the exhibition halls – where you are greeted by an almost grotesque installation of a dummy in a full-body rubber suit and a gas mask looks at you through a window frame … as if to say: welcome to nuclear hell, my friend! Next to this the installation continues to resemble a church door, but the way through is blocked by a radiation warning sign. To the right, another green rubber suit appears to be wielding a metal cutter … but then you notice the suit and hood do not contain a body/dummy, and it is just hanging suspended from barbed wire. All this grimness continues with three more dummies, now free-standing and wearing sinister-looking gas masks. Back in 2006 a large central area of this exhibition hall was left bare, the empty floor designed to look like a reactor core lid of the Chernobyl type, i.e. a roughly octagonal area composed of ca. 8x8 inch squares, some of them colour-coded, under which the fuel and control rods would poke down into the reactor core (cf. 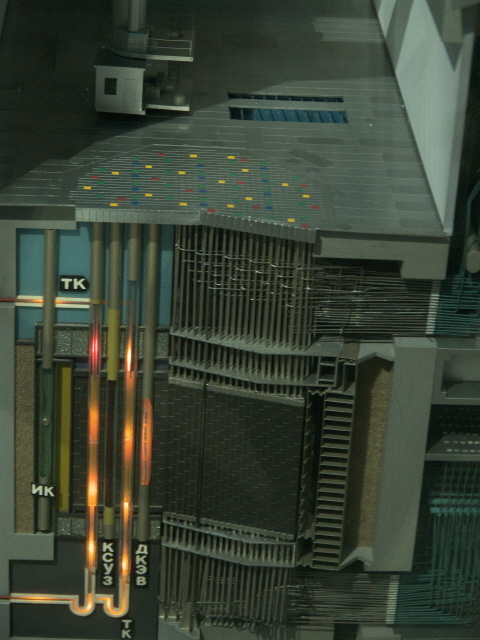 the photo of the reactor model in the gallery below). In May 2015 I found this design only partially visible, as its surface has become a bit cluttered with extra exhibits and other objects, including seats for people watching the video projection on the far wall. So I guess many a visitor may not even notice that the floor design is supposed to represent a reactor hall. The octagonal shape is picked up again on the rear wall: here that octagonal shape is formed by little portrait photos of children. There are four such shapes, and in the centre a large video screen shows some film footage related to the story of the children affected by the disaster. 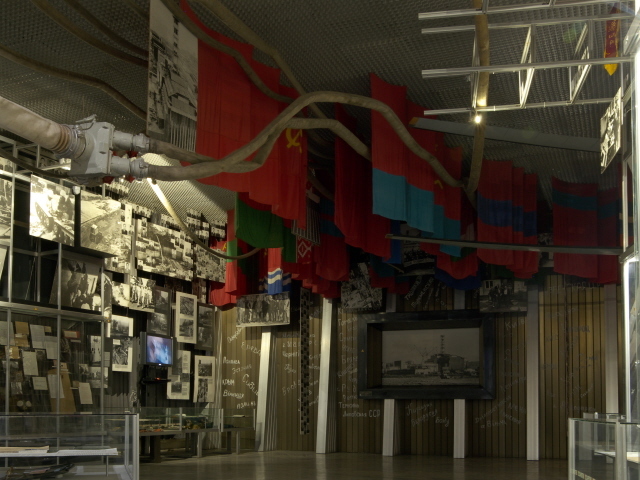 Along the side walls of this hall are further displays, mostly about the former rural village life in what is now the Exclusion Zone, and also about the resettlers (see under Chernobyl in general). Yet another interactive screen shows, for instance, the spread of the radioactive cloud as it travelled north first over Belarus and then the Baltics and into Sweden, then west as far as the British Isles. Overall, the museum has a certain level of surrealness about it, in the way it is laid out (e.g. 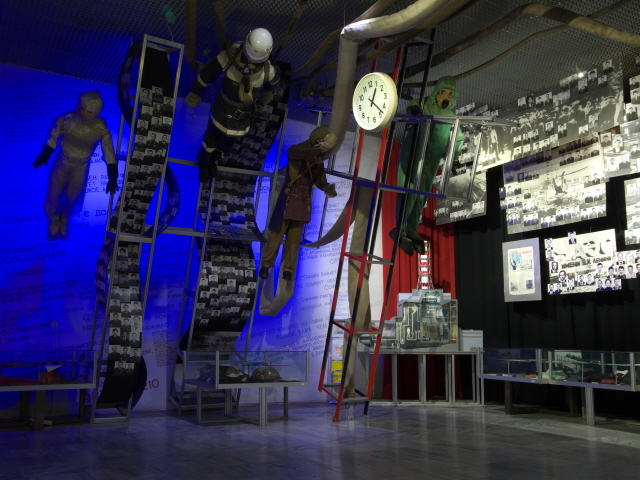 lots of objects suspended from the ceiling), in some of the artistic exhibits and so on – but it does work rather well, especially in contrast to – and complementing – the grim and more realistically gripping trips to Chernobyl itself. Location: in the "lower" Podil district of Kiev, the old merchants' quarter close to the river Dnieper, a bit north of the "upland" city centre. Address: 1 Provulok Khoreyva (Khorvy Lane). Access and costs: fairly easy to reach from central Kiev, and very cheap. Details: To get to the museum you can take the metro to Kontraktova Ploshcha, on the blue line (M2), two stops from Independence Square (Maidan Nezalezhnosti). From there walk to the northern corner of the square and turn into Spaska street and then immediately left. From around the square the museum is signposted, with its full official title "Ukrainian National Chornobyl Museum". Once you get there it's impossible to miss, as you'll see those Soviet vehicles parked outside. The building is a former fire station with a tall tower. But you could also walk it all the way from the city centre – in fact you can make it a particularly nice walk, taking in some major tourist sights en route. From the Maidan first head north-west until you come to St Sophia's, then head east to St Michael's, then north, past the overly grand Ministry of Foreign Affairs and on to St Andrew's; and then down Andriyivsky Uzviz (Andrew's descent), the winding cobbled street where most street vendors of souvenirs and arts and crafts set up their stalls. (See under Kiev in general for photos of all these sights). At the bottom you then have to cross diagonally across Kontraktova Square and follow the directions above. Guided tours in English for small groups of 2-10 People (one hour) cost 200 UAH (half that for groups up to 20). Audio-guide hire (available in Urkainian, English, German, Japanese, Russian, French and Italian): 50 UAH. Photo permit 20 UAH, video permit 50 UAH. Time required: roughly an hour (that's how long guided tours are) – or possibly longer, depending a bit on your language skills and depth of interest in the more esoteric exhibits. Combinations with other dark destinations: in general see Kiev. Obviously, going to Chernobyl itself is the associated prime dark attraction of Ukraine as a whole. 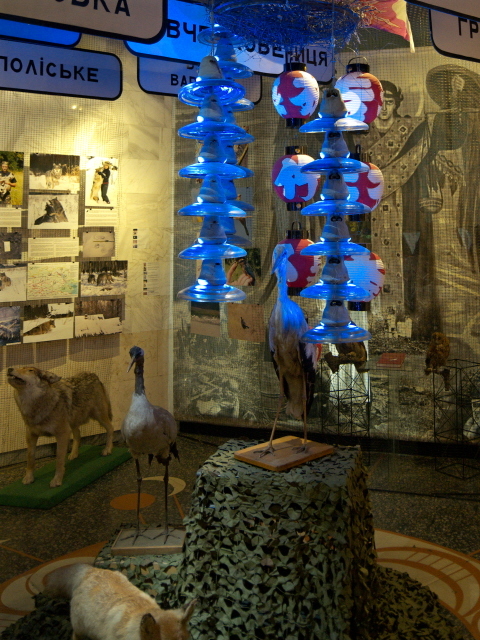 And if you're interested in the museum's topic you are probably interested in going on a tour to Chernobyl as well. I've heard of people who visited the museum and then got too scared to actually go on such a tour afterwards. In a way I can understand this, as the museum does indeed lay it on thick in visually sinister-looking exhibits and displays. But use your common sense (and just a little bit of physics and radiology) and you'll see that going on such a tour isn't actually that risky in terms of radiation. You get higher exposures during an X-ray or as a frequent flyer. See the relevant sections in the general Chernobyl chapter for details! So don't let yourself be scared off. A tour to Chernobyl really is amongst the most fantastic things one can do as a tourist on this planet. Absolutely top-notch. In comparison the museum can only be a little indication, though it does complement a tour quite well. But it cannot replace it. Combinations with non-dark destinations: The district of Podil that the museum is located in has its own distinct charm, even if it is a little rough around the edges. And it gives you good access to the waterfront. If you walk along the river to the south-east, the funicular can take you back to the upper town just behind the Ministry of Foreign Affairs and St Michael's monastery. In general see under Kiev.